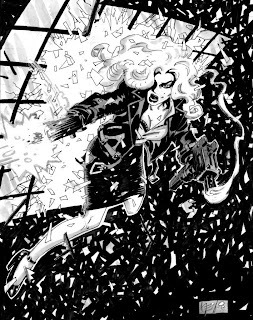 Iwas asked to do a in up for friend's Chris Mills and Joe Staton's online strip FEMME NOIR. 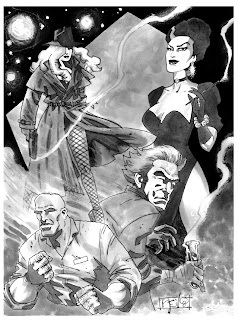 They're putting out a book with several stories and a few pin ups soon-now here's the amusing thing-to me- my first attempt was nicely done but very lazy on my part- i went ahead and did "my" version of the lead female character instead of appreciating the author's concept more thoroughly- thus, my "out of period" take on the gal. 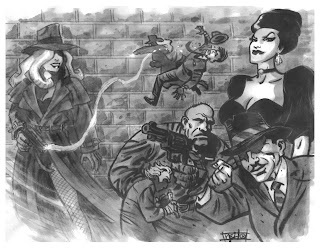 OK-my bad-so i redrew the piece more to the atmosphere of old forties detective films,including several villain types in the design. But something about the composition bothered me. This is the one i sent to Chris. 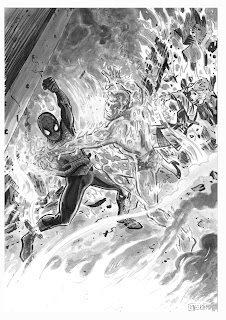 And here's another cover "reimagining" i did for a fan who once asked me to do my version of Spider-Man # 152 with Spidey battling the Shocker.